provide you with optimal vision, comfort and health. We have contacts available to target specific eye problems like dry eyes, astigmatism, difficulty reading, and eye diseases like keratoconus. We are focused on giving you the best comfort and vision, not just adequate comfort and vision. Contacts are constantly being improved for more comfort and better vision. Soft contact lenses are made of soft, flexible plastics that allow oxygen to pass through to the cornea. Soft contact lenses may be easier to adjust to and are more comfortable than rigid gas permeable lenses. Newer soft lens materials include silicone-hydrogels to provide more oxygen to your eye while you wear your lenses. Rigid gas permeable contact lenses (RGPs) are more durable and resistant to deposit buildup. They tend to be less expensive over the life of the lens since they last longer than soft contact lenses. They are easier to handle and less likely to tear. However, they are not as comfortable initially as soft contacts and it may take a few weeks to get used to wearing RGPs, compared to several days for soft contacts. Continuous wear contact lenses are available for overnight or continuous wear ranging from one to six nights or up to 30 days. Continuous wear contact lenses are usually soft contact lenses. They are made of flexible plastics that allow oxygen to pass through to the cornea. There are also a very few rigid gas permeable lenses that are designed and approved for overnight wear. Length of continuous wear depends on lens type and your eye care professional's evaluation of your tolerance for overnight wear. It is important for the eyes to have a rest without lenses for at least one night following each scheduled removal. The majority of soft contact lens wearers are prescribed some type of frequent replacement schedule. "Disposable," as defined by the FDA, means used once and discarded. With a true daily wear disposable schedule, a brand new pair of lenses is used each day. Some soft contact lenses are referred to as "disposable" by contact lens sellers, but actually, they are for frequent/planned replacement. With extended wear lenses, the lenses may be worn continuously for the prescribed wearing period (for example, 7 days to 30 days) and then thrown away. When you remove your lenses, make sure to clean and disinfect them properly before reinserting. The hybrid contact lens combines a rigid gas permeable center and a soft lens skirt into one unique "hybrid" lens. The rigid center corrects farsightedness, nearsightedness and astigmatism and delivers clear, high definition vision, even at night. The soft skirt surrounding the center provides the all-day comfort of a soft lens. Orthokeratology, or Ortho-K, is a lens fitting procedure that uses specially designed rigid gas permeable (RGP) contact lenses to change the curvature of the cornea to temporarily improve the eye's ability to focus on objects. This procedure is primarily used for the correction of myopia (nearsightedness). Overnight Ortho-K lenses are the most common type of Ortho-K. There are some Ortho-K lenses that are prescribed only for daytime wear. Overnight Ortho-K lenses are commonly prescribed to be worn while sleeping for at least eight hours each night. They are removed upon awakening and not worn during the day. Some people can go all day without their glasses or contact lenses. Others will find that their vision correction will wear off during the day. The vision correction effect is temporary. If Ortho-K is discontinued, the corneas will return to their original curvature and the eye to its original amount of nearsightedness. Ortho-K lenses must continue to be worn every night or on some other prescribed maintenance schedule in order to maintain the treatment effect. 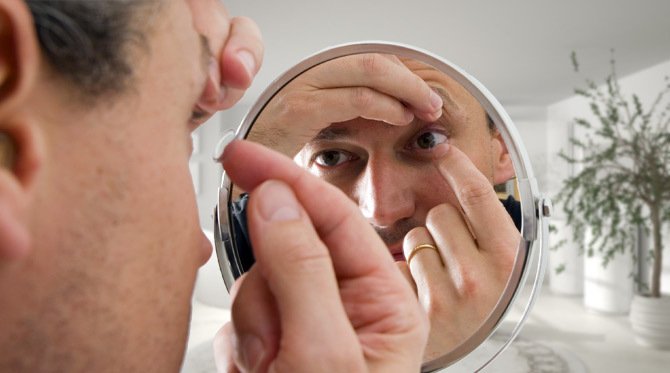 Your eye care professional will determine the best maintenance schedule for you. Some contact lenses do not correct vision and are intended solely to change the appearance of the eye. These are sometimes called plano, zero-powered or non-corrective lenses. For example, they can temporarily change a brown-eyed person's eye color to blues. Even though these decorative lenses don't correct vision, they're regulated by the FDA, just like corrective contact lenses. Scleral lenses are larger lenses made of gas permeable material used to correct vision in a number of conditions such as keratoconus, post-refractive surgery corneal issues, ocular surface disease, dry eye, and even normal refractive errors. Prosthetic lenses are used to achieve an improved cosmetic appearance when an eye has a misshaped pupil. If two eyes appear different due to a pupil irregularity, prosthetic lenses can be designed to match the iris of the other eye.